Kerala Pictures - Visit the beautiful scenery of Kerala and its amazing natural sights in Kerala pictures Gallery. Kerala pictures gallery highlight the Best pictures of kerala. Watch Kerala House Pictures, Kerala Backwaters Pictures, Kerala Festivals Pictures, Kerala Beach Photos, Kerala Festivals Pictures, Kerala Coconut Tree Photos, Kerala Houseboats and many more promoted by Kerala Tourism Pictures. A paradise on earth which is wedged between Arabian Sea on the West and the Western Ghats on the East a narrow strip of land known as Kerala, is a destination of a lifetime. Popularly known as God's own country Kerala. 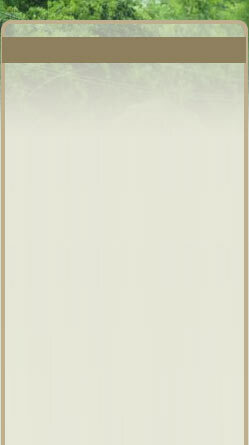 Picture Gallery occupies a pivotal place in the world tourism map. 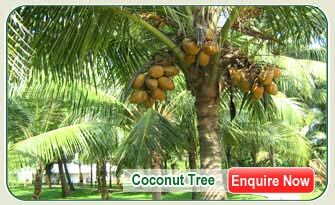 - Book your Vacations in Kerala. - Explore the green land of Kerala. 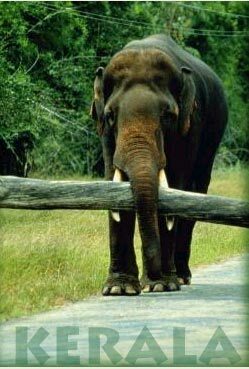 Elephants hold an important place in the daily life of Kerala. These huge animals are groomed, revered, loved, pampered and given a prestigious position in the state's culture. There are quite a few festivals in Kerala revolves round the elephants. - See the wild ness of Kerala in the wild life tour to Kerala. 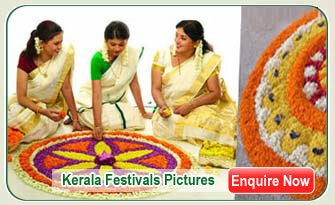 Kerala is a bouquet of several fairs and festivals. The festivals of Kerala are as diverse as the land itself. To name a few festivals of kerala are Onam, Pooram, Pongal and Boat race which attracts not only the local people but also the tourists around the globe. - Plan a trip to the unique festival of boat race. 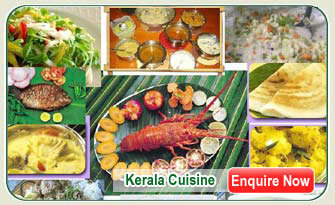 Kerala is famous for its culinary treats. The dishes here are exotic mixture of nature's very best which are just finger licking. Be it leafy or root vegetables or spicy non vagetarian or the rice flavoured savoury 'appams' or crunchy chips variety even delicious seafood delicacies ..Kerala has it all. Kerala and back water are just synonymous. Cruising along the backwaters of Kerala is an ideal way to discover the real Kerala. A tour to Kerala back water ensures you to experience the beauty that personifies God blessing bestowed on this beautiful land. 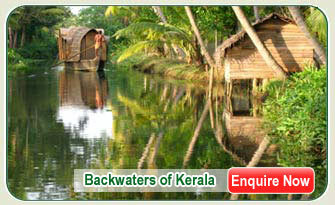 - Avail and enjoy Kerala back water tour. 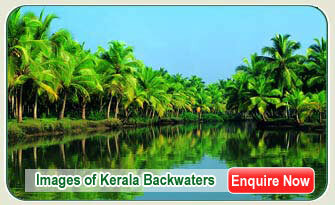 - Choose your own back water holidays in Kerala. 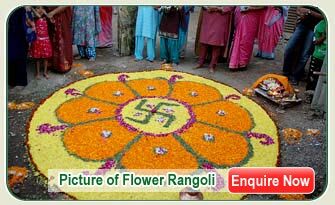 No celebration in Kerala is complete with out Rangoli the beautiful Flower Rangoli picture of Kerala which is known as 'kolam' in Kerala.Decorating the front of the house with different colours and rice powder is an important activity to the women of Kerala. 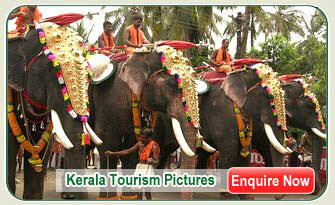 - Explore the culture of Kerala in kerala cultural tour. This Kerala Tourism Pictures Kerala house boat offers unique opportunity to experience the breathtakingly beautiful backwaters which consists of networks of lagoons, lovely lakes and canals. 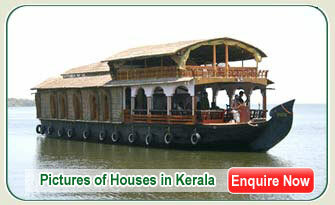 The house boats of Kerala provide a leisurely journey in the world of nature. In Keralian society fishing community is one of the most vulnerable sections. 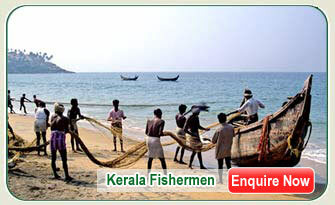 Fishing is the main living in Kerala and the fisherman spread along the wonderful beaches of Kerala. They lead a tough life but their high spirit let them survive with happiness. - Explore lovely fishes in the beach tour of Kerala. - Select your favorite tour. Banana, the soft and sweet fruit of this tropical plant is enjoyed by people from around the world. 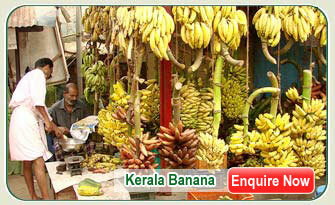 There are 50 variety of bananas in Kerala. Every houses in Kerala treat the guest with crispy banana chips.